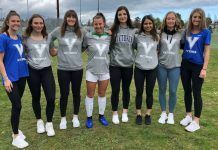 VICTORIA – In the annual battle for West Coast supremacy there can be no denying that the Univeristy of Victoria Vikes came out on top, after their four crews combined for four victories to shut out the UBC Thunderbirds and claim Brown Cup glory on the Fraser River on April 7. The sweep was the first time since 2011, the year reserve races were added to the Brown Cup, that a school has claimed victories in both the men’s and women’s reserve races as well as in the men’s and women’s varsity races. The day wasn’t without drama however; while the Vikes women comfortably cruised to their two victories, the Vikes men twice had to battle adversity after a clash of oars between themselves and the T-Birds. Crossing the line first, the Vikes women’s reserve crew was able to fend off an early push from UBC before exploding past their rivals at around the halfway mark of the race and build out a boat-length lead that they would hang on to all the way to the end of the race. The first drama of the day came in the men’s reserve race. With the two boats neck and neck in an area where the river narrows, there was a tremendous tangle of oars between the two crews. The Vikes had to pause and recover their grip on the oars, losing valuable seconds to a T-Birds boat that emerged unscathed from the contact. Despite that disadvantage, the Vikes men were able to claw their way back into the race and pull off the amazing come-from-behind victory. The women’s varsity eight was next on the course and a Vikes crew that has been outstanding all year long was able to save some magic for their last race together. They pulled out to an early lead over UBC and were able to row off into the distance to claim their sixth Brown Cup title in the past eight years. That victory meant that the Vikes eight pulled off the treble on the season, winning the Western Canadian University Rowing Championships, the Canadian University Rowing Championships as well as the Brown Cup. In the final race of the day the Vikes men’s varsity boat showed great perseverance in completing the sweep. With the Vikes leading by a seat’s length near the halfway point of the race, the Vikes and T-Birds again collided and once again it was the Vikes who came out on the wrong end of the contact. The race was forced to halt and a lengthy delay was caused after the Vikes boat was damaged. When the race was re-started the Vikes held a seat length lead. After a back and forth race it was the Vikes that pulled away for a boat length win and the Brown Cup title. The Brown Cup brings an end to the varsity racing season for the Vikes and with a clean sweep over their biggest rivals, the rowers from the University of Victoria achieved their fairy tale finish to what was a great season for both teams.